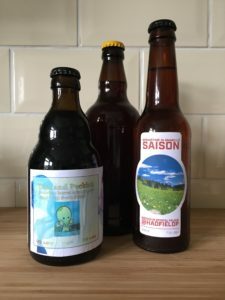 This week it’s all about those homebrewers again! In what will now be our last ever Hombrew Special we are joined by Rob Woodland, Paul Hadfield and Rich Caller as they share their beers with us. Rob gives us ‘Prime’ an American IPA with no bittering hops, from Paul we have single hopped saison ‘Springtime in Amarillo’ and Rich gives us ‘Dim and Peckish’, a barrel aged extra stout with added brett. Plus we get the guys thoughts on the new Brewdog homebrew competition and there’s another #Hopinions. Steve refuses to issue a #prizelessprize this week as he believes his picture should have won it so eventually settles on this one.